Weeks of public statements on blockchain tech culminated yesterday with IBM unveiling a comprehensive strategy that found the IT giant diving deep for the first time into how it will seek to deliver business solutions based on the emerging technology. While IBM had previously gone public with its work with its leading role in the Linux-led Hyperledger Project, and had been open about its theses on the approach of other providers, the announcement can viewed as the opening salvo that signals its charge into the industry armed with a depth and overall presentation that are unique among its peers. All told, IBM revealed the central pieces to what it said is a years-in-the-making strategy, including how its blockchain-as-a-service (BaaS) offering will incorporate existing company assets such as IBM z Systems, its core IT system for top 100 global banks; the Watson Internet of Things (IoT) platform; and Bluemix Garage, its development workshop initiative. With the news, IBM becomes the second major tech giant to launch a BaaS offering, alongside Microsoft, which has added a flurry of blockchain technology providers to its development sandbox since its unveiling in October. In interview, IBM’s vice president of blockchain technologies Jerry Cuomo expanded on the difference in his company’s market strategy, complementing Microsoft for its service and the ability of those who use it to quickly launch test blockchain networks, but stressing what he believes is a considerable, underlying difference. Cuomo sought to position Microsoft as more open in its view on the available blockchain networks, whereas with IBM’s BaaS service, business clients will use the IBM Blockchain fabric, a public-but-proprietary offering he contends was crafted with a specific vision. Cuomo described IBM’s new consensus algorithm as offering improvements in privacy and auditability that would allow businesses to be able to create blockchain applications for a wide variety of specific use cases, with arguably unmatched speed and support. Initial users of the platform include impressive brand names such as the London Stock Exchange (LSE), Kouvola Innovation and Japan Exchange Group, operator of the Tokyo Stock Exchange, suggesting the message is resonating to potential enterprise users. Perhaps given the number of announcements, Cuomo was keen to unpack the terminology surrounding the release, explaining the IBM Blockchain fabric and how it differs in aim from other available blockchain networks. To Cuomo, the term “fabric” refers to the basic “DNA of a blockchain” as well as a business network across which transactions can be replicated and members can access a shared ledger. The latter attribute, he said, will allow users to create transactions that have logic, such as programmable contracts that would govern how an asset would be managed over a specific length of time or under certain conditions. “The fabric enables a ledger, it enables a network to be created,” he added. In its release, IBM elaborated on technical details, stating the service will feature a “pluggable architecture” to allow users to experiment with different software modules; cryptographic identity management tools and smart contracts written in Java and Golang; and privacy and confidentiality controls that allow users to specify who can view and execute smart contracts. The functionality differs greatly from current public blockchains, such as bitcoin and Ethereum, in which any participant can join the network and participate in its operation. Further, its smart contract offerings are written in more familiar development languages, whereas Ethereum, for example, uses wholly new languages. The BaaS offering also features some overlap with its work on the Hyperledger Project, a separate collaborative effort that has so far united 30 industry stakeholders, including startups, financial incumbents and potential end-users of the technology, all with the goal of creating an open-source blockchain offering. IBM’s consensus algorithm, Cuomo remarked, will use 44,000 lines of code it has contributed to the Hyperledger Project as a founding member, but remain a distinct offering due to its value-added services. As an example of what this test environment allows, IBM included a sample blockchain application on its website in which developers can experiment with asset transactions. “We have a simple example called a ‘Marbles App’, that allows you to create an exchange for creating and exchanging marbles. This helps developers understand the basics for blockchain, the definition of an asset, in this case it’s a marble of different size and color, and the ability to exchange assets between members,” Cuomo said. IBM intends to launch additional demos on its website, with its page displaying as-yet-unlaunched demos including a “Smart Contract Investigator”, which will allow developers to experiment with smart contracts; and a “Car Lease Demo” that will provide an overview of blockchain-based supply chain applications. Cuomo framed the service as one that would enable users to collaborate within its cloud, stating that users can use the technology to connect with peers. As with the Azure service, the offering is still in testing, opening to developers first with the goal of scaling it so that, eventually, production versions of blockchains created within the offering can be launched publicly. Cuomo cited Japan Exchange Group as a company with such aims, working on proofs-of-concepts (POCs) aimed at innovating on systems for the exchange of low-liquidity assets. “They’re starting using our test services with the goal of graduating,” he added. Here again, Cuomo acknowledged there is some overlap between Hyperledger and IBM’s work, as Japan Exchange Group is also working on the former project’s technical committee, in part, because of its aspiration to include regulators in its projects. “The exchanges getting involved want to make sure their regulators have access to the code, so they’re involved in the Hyperledger Project. But we’re working with them with our hosted services,” Cuomo said. Cuomo went on to suggest that he sees such business activity around both IBM’s consensus algorithm and the Hyperledger Project sending a positive signal to regulators, as its clients want to ensure their projects meet the approval of global government agencies. Key to IBM’s offerings, Cuomo said, will be their ability to leverage existing offerings such as IBM z Systems, its system of mainframe computers and distributed server technologies. On its website, IBM touts that its z Systems offering could take blockchain performance to “new levels” given that the system can handle “massive amounts of transaction data”. “Accelerate time to value and reduce complexity and cost by accessing System of Record transactional systems and data already on z Systems,” the company’s “How Can IBM Help?” section of its blockchain domain reads. Cuomo said that z Systems would allow users to “tune their fabric”, encrypting transactions as they’re passed along the network and validated by peers. “z Systems has been known for its ability to perform cryptography at high scale, so the system should be able to scale more readily when run on z Systems. It looks like a platform that was made for this workload,” he added. 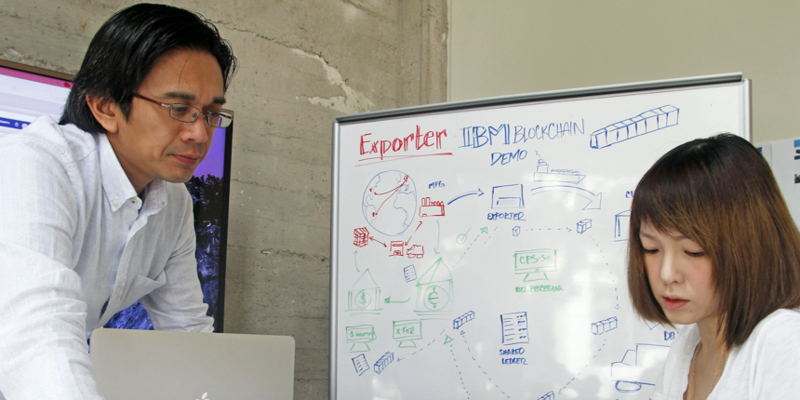 Coming soon, the company plans to launch its IBM Blockchain DevOps service, which Cuomo said would allow clients to set up mini-blockchain networks in as little as 12 seconds. To help its potential clients better understand these aspects of its technology in the meantime, IBM is launching IBM Bluemix Garages in London, New York, Singapore and Tokyo that will seek to provide in-person support to developers looking to design and implement blockchain POCs. There, Cuomo said IBM will offer clients the chance to engage in “90-minute interactive sessions” with subject matter experts who can help them make their ideas actionable at impressive speeds. Telepresence and web conferences are also available to clients. Cuomo believes clients will find value in that they will be able to use his team’s knowledge to quickly make the technology actionable. More information on IBM’s full range of offerings can be found here.